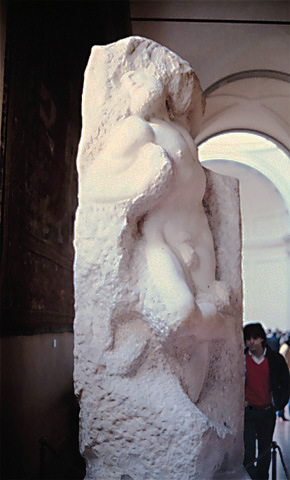 To see how Michelangelo carved, let’s look at his unfinished statues, especially the ones that are only blocked out. They should tell us, shouldn’t they? They should but they don’t. They rather keep the mystery. It’s as if the old master, like a sly Merlin, had locked up his secret in them forever. You can’t study them without confusion. Sculptors for five hundred years have not agreed on how Michelangelo proceeded, though they had these enigmatic works right in front of their noses. It doesn’t teach that at all. The most striking thing about it is that it looks like a relief! Only the front half is carved, as if Michelangelo, like a painter, were interested in only the front view. As if he carved ignorantly away like a beginner without worrying about the depth of the features and how they would look from another angle. As if he could leave the backside of St. Matthew to take care of itself. This is a terrible example of how to carve a figure in the round, a treacherous example for sculptors, who often err in just this way. 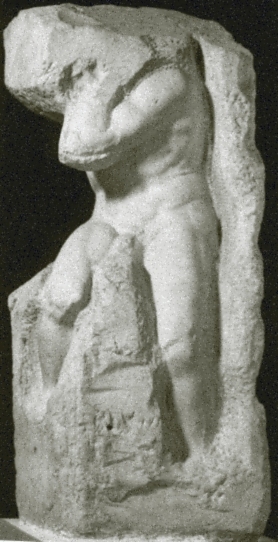 The least finished of Michelangelo’s statues, the ones that should therefore tell us most about his carving technique, are the most mysterious. They are the so-called “Giants”, now exhibited in the Accademia in Florence, left and right of the broad hall that leads to the David. They represent slaves and they writhe and twist to get free—free from their condition as slaves but also, it looks, from the rock that imprisons them. Michelangelo started carving all of them from one side, the same as he had done the St. Matthew, as if he were doing a relief instead of a round figure. He goes very far toward finishing one half while leaving the rest, the other side, in the rock—a very unadvisable proceeding. What is new in the “Giants”, and downright baffling, is the presence of so much excess stone. The “yawning” slave, the one called “The Awakening Giant” has almost stretched himself out of the block. Why doesn’t Michelangelo give him some hip room now that he has given him elbow room? Why doesn’t Michelangelo give himself, the sculptor, room to work? What’s that long wall of rock doing beside the giant, now that he’s free of it and it will have no part in the finished statue? It only gets in the way. Try to carve anything at the bottom of a ten-inch canyon of stone and see how you like it. The slave called “Atlas” is even worse. The meaningless wall of marble runs all along the one side and the original mountain is still there in the middle. So Michelangelo has had to gouge out the leg, to dig it out of a rut in some places twelve or fifteen inches deep. There was room enough for a chisel but barely enough for his hand way down there! What is the point of cramping himself so? Why doesn’t he eliminate all the stone left and right—the canyon walls—if only for his own comfort? Once more Michelangelo looks like the blundering novice. He’s worked himself into a hole. But who is the master here and who’s the student? The fact is, this was the method that produced (if a method can produce) some of the greatest statues ever carved. It might be argued that they could have been made using the traditional carving method and that this doing-it-as-if-it-were-a-relief approach was just another of Michelangelo’s eccentricities. But it is better to argue that the execution and the achievement go together, that just as in painting, the how is inseparable from the final what. Michelangelo’s friend and biographer, Giorgio Vasari, himself a professional artist, says he knows how the master carved his figures. He says Michelangelo laid his model into a little box like a coffin. He filled the box with water until the figure was submerged. Then he slowly let the water run out of the box or dipped some out. The first parts of the figure to emerge from the water like islands were the parts Michelangelo had to cut out first on his stone block. Of a face, for example, he would first do the nose, then the brow, then the moustache, the chin, the eye-lids, and so on. Now this is a fine way to illustrate the carving of a figure but as a working technique it has real drawbacks. Was it really Michelangelo’s working procedure or only a practical example, an illustration for Vasari’s general reader, of how a statue is cut out of the stone? What’s wrong with it? One, the actual measuring of the depth of each figure as it comes out of the water seems very complicated and inexact. You could color the water to make a greater contrast with the figure but the water-line might not always be easy to determine where the prominences are vaguer, such as the gentle hills of a torso. Water surface tension would also cause you trouble. The water would cling to the sides of the emerging bulge and register higher up than it should. Another drawback would be the model. To make accurate measurements you would have to use a finished or far-along model. Even if it were substantially smaller than your projected marble statue, its modelling would take a long time and this would mean that the actual creation goes on not in the marble but in the clay. But these practical difficulties could all no doubt be overcome. What is really unbelievable is that the master would be the slave to such a mindless system. Maybe the mummies were for the workshop helpers. But no artist could put up with the endless measuring as if he were a sort of animated mechanical device, reproducing an object which happens to be his own statue. All his aesthetic discernment is disengaged with such a method. His judgments all have to do with numbers and distances—with geometry—the accidence of a miniature earth. The prominences he carves lose their coherence, their meaning. They are no more than rocky islands sticking out of the sea. You might know that the half-centimeter you must cut out next is a knuckle or the tip of a nose but the method wouldn´t let you do the whole nose or knuckle until the water-level falls in the coffin. A painter rather than a sculptor? Nearly all his statues were intended to be shown with their backs to the wall and the unexhibited back-side of many was never sculpted. So Michelangelo conceived and treated them as reliefs and worked on their good side, bringing it to near completion, before dealing with what would not be shown. And, however implausible it seems, the high marble walls of the Boboli “Giants” do seem to exemplify a carving method as explained by Vasari. They could only have been used to measure depth, apparently with reference to a model and… the walls of its coffin. Benvenuto Cellini, a goldsmith and sculptor who knew Michelangelo, says he saw life-size clay models of the figures in the Medici Chapel. He doesn’t mention any boxes enclosing them but the existence of such large models proves that Michelangelo copied them in marble, somehow. Actual relief sculpture differs from sculpture in the round in that, since it is fixed to a slab of marble, it must create an illusion of depth by superimposed planes. In that sense, Michelangelo’s figures were not reliefs. 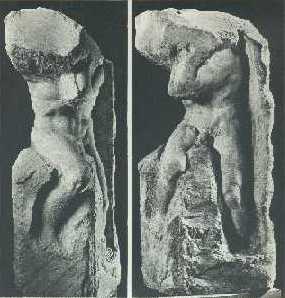 This entry was posted in aesthetics, art, art history, great artists, Michelangelo, sculpture, stone carving and tagged Michelangelo, relief, St. Matthew, stone carving technique, Vasari. Bookmark the permalink. I watched a show on Bernini and was awestruck. It just doesn’t seem possible to carve stone so well. If I had another life to live I might like to be a sculptor – assuming I could find a sugar mama – or maybe something easier like yacht designer or genetic engineer. Bernini had a sugar daddy–one that was a master carver and who brought the kid up to be a genius sculptor. He put a little baby hammer and chisel in the crib and gave the little tyke a baby block of marble for a birthday present (at four?). When the lad was a little older he pulled strings and blew his horn for him at the bishop’s palace too. Bernini did fine in life but you wonder whether he ever thought he’d like to be something else in another one. Talk about programmed. But you be careful, Bill: in another life you might be a grasshopper or something. I saw a painting by Jack Hines (an old New York illustrator/painter) depicting a grasshopper on a leaf floating in a stream. Near the leaf was a trout. The title of the painting was “Perilous Journey”. I thought this was such an interesting story! Thanks for sharing it, as well asyour thoughts about the method. So, does that mean you think Michaelangelo’s assistant was not telling the truth about his master’s method? I’m glad you enjoyed the post, Madame Monet. Thanks for saying so. No, I think Vasari was saying what he knew. And for all anyone knows, Michelangelo DID use that coffin method to measure the depth of his figures as he carved (probably without the water, however?). I can think of no other explanation for the wall of stone beside the unfinished ATLAS Giant. The thing is, the whole coffin business is unnecessary. I have carved reliefs and figures in the round, measuring occasionally with compasses, which was the traditional method and, I thought, good enough. Why Michelangelo rejected it, God only knows. This was a pretty good website but it didn’t tell anough info….SOOOOOOOO i hated it and now i didn’t get my project done!!!!!!!!!!!!!!!!!! for a day to day log, 65 days, of carving a marble Pieta using Michelangelo’s method of carving. Day 65 is beautiful ! I have posted here somewhere about how I believe he carved. It has to do with what I call profile carving. It was essential for eye protection and allowed for large chips to be removed fast and efficiently. Thanks, John. I appreciated your comments and I’m putting a link to them here. I hope you are well by now and have gotten back to carving. I am great and carving some of my best new works. I am also back to teaching. Profile carving is the name of the game. It is fast efficient and accurate. Great article! I find that Michelangelo’s approach is not just inspirational to other sculptors, but to designers in other competencies. He discovered what was inside the stone rather than forcing his art into existence. I also wrote an article comparing Michelangelo’s approach to Einstein’s and what we can learn from both of their processes. David Kaplan: Thanks for your comment. I enjoyed your article on Einstein and Michelangelo’s Design. Cornelius Sullivan: That was a fine article on Michelangelo’s carving method. As you can see from my post on Michelangelo vs. Bernini, I have some of the same ideas. I had never seen the remains of the Virgin’s first face in the Rondanini Pieta, only the abandoned arm of Christ, so different from the final version. I enjoyed seeing your own sculpture and painting, too. I know nothing about anything you’ve discussed, other than a love of the Pieta piece, and an enthusiasm for the Medici history and renaissance Italy, but this article was a fantastic read. Thank you so much for sharing this in a language that even us “outsiders” can understand and follow along. Fascinating story! He found a point in the form and followed it. By doing a nose or a knee he found everything else. He didn’t need a model to follow, he carved direct. He was doing the fun part which is finding the form which can be thrilling. That is why there are large sections of stone left. Removing large areas of stone is fairly boring and difficult. Maybe not, but that’s how I have carved for years. I have only rarely used plaster models for carving, I prefer my eye and, for the most part, my memory. I am certain he did the same thing. Remember, I believe Michelangelo had said himself that he could “see the figures in the stone” before he cut. He just removed the stone that needed to be removed to let the figure out. Perhaps he had no more method then that. I don’t know how Michelangelo was taught his trade, but perhaps he WASN’T taught. As a child artist I was self-taught, so developed some pretty odd techniques. When copying from a photo my method was put a small dot in the exact center of the photo (portrait or other), then put a small dot in the exact center of my blank sheet of paper. I would then render every minute detail surrounding that dot, expanding outward like a flower, revealing the duplicated image as if through an ever enlarging hole. Enough to make an art teacher pull their hair out, but that was my method – and with some impressive results. But it was also a terrible handicap, which is why I would have benefited greatly from guidance early on. All that to say that my intuition about Michelangelo is that he was self-taught; he found a technique early on that though juvenile and ill-advised, it worked for him (to put it mildly) and he was loath to change his technique later, lest it compromise his success. And apparently he simply had the brilliant mind to pull it off. He really could hold in his mind that beautiful image buried in the stone, and simply set about liberating it, maybe like what Meg White said above. This also makes me think of Mozart (if the stories be true), who crafted his music entirely in his head, able to hold it all in his mind complete, then to merely write the final draft onto paper like dictation. …So, regardless of how “poor” Michelangelo’s technique may have been, he was was such an over-the-top genius that he could push past all that and still blow EVERYBODY away. Made me remember Titian smirked at because of his “lack of drawing skills” at the time: Delacroix made his own remarks in this respect – he had noted a certain “amateurish” way in his works – but at the same time he deeply appreciated the painter’s inherent qualities. William Blake condemned Titian: It seems his drawing ideal was Fuseli. According to Blake’s standards Titian was an amateur painter of undeserved fame. As far as I remember, he even put his depreciation in verse. I was dumbfound. Ruskin’s comment here tallies with Delacroix’ entries in his (priceless) diaries: Somewhere he talks about Titian being kind of an “acquired taste”, that “if one lived for 120 years one would prefer Titian to all the others”.